* Total number of reviews and star-ratings are based on data collected during the time period Main Heating Cooling Inc has been using the ReviewBuzz system and may not directly match the data found on each public review site. David was friendly & informative. The crew were polite and friendly. They cleaned everything up nicely when the job was done. Dave is very professional and competent. He patiently explained the various technical aspects of my new equipment and its associated procedures. Dave and installation team went above and beyond expectations in the installation. No trace of debris was left behind and an optimal solution was found and a speedy installation was performed. I would do this again with Dave and team in a heartbeat. I got multiple estimates. 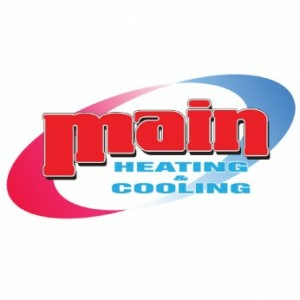 Main’s was the best for top quality furnance and hot water heater as well as competitive prices. Crew did an excellent job which was completed in 1 day. They took away the old appliances and cleaned up job site. I was very satisifed with the whole crew. Special thanks to Stacy in the office for helping coordinate everything, answering all my questions and quickly submitting my rebates. Main Heating and Cooling did excellent work. They were on time, courteous, and cleaned up when finished. We love our new system!! It’s shocking how hard it is today to find a company that is on time, thorough and commercially competitive. Main was all of these when the installed my new Lennox air conditioner. I’m super happy with my experience with Main. Dave and his team did a great job installing a new furnace for an emergency CO2 problem. They are very knowledgeable about heating systems. Also, they were fast and careful while moving in and out of the house. Thanks again Main Heating and Cooling! Terrific company Starting from David , the owner, down - everyone was highly knowledgeable, well informed and extremely pleasant. Just the type of people we want to be associated with. EXCELLENT COMPANY! Main made our needs a priority and made sure that our hot water heater and boiler were functional as soon as possible. It wasn't their family that was taking cold showers, but they treated us as if it was. They went above and beyond my expectations! The pricing seemed very fair. Very satisfied with the Lennox product we chose. Since Main also installed our furnace years ago, I was already familiar with their team and quality work. Main has always done very professional work for us. Our experiences with Main have always been positive. On time, friendly,neat and orderly and helpful about operation. Main Heating & Cooling installed our new Lennox Air Conditioner a few weeks ago. Just in time for the hot summer days. The staff is wonderful! They scheduled us in quick, installed quick. We have ice cold air now! I love that we can adjust our temps from our smart phone. Thank you Dave! Job went well there are a few lose ends to tie up that need to be taken care of which has nothing to do with the job they did. So far we are satisfied with all that they did in installing what we purchased. The work team were polite and wanting to please us with the job, which they did. Thanks to all! Main Heating and Cooling did a great job installing a new furnace and A/C unit. They were prompt, professional, clean and quick. In addition they were very nice guys who were polite and even took time with my puppy who was thrilled to have house guests. The work they did was very well done. We had to replace the original units from the 1980s. They replaced everything and thoughtfully improved what we had in pipes, ducts, and the units themselves. The cost was inline with the work and the execution was exceptional. Professional and courteous. Don't over sell. Back up product and installations extremely well. We have purchased furnace 5yrs ago and A/C recently. Only hvac i'll deal with. The team of Jeff, Devin, and Dave (I hope I got those names right!) were very pleasant, worked very hard even though they were working in the cold heavy rain, explained everything to me about what was being done/installed from the unit to the thermostat, cleaned up very well, and did an excellent job for me. I would recommend these 3 gentlemen anytime. Estimates and plan measurements were accurate. The work was done professionally and with a willingness to explain things during the install. The crew was friendly and left the work sites cleaned and organized. Main Heating and Cooling . Customer service is always a top priority at Main Heating Cooling Inc. Our BBB Membership rating is like a badge of honor as we continuously strive to provide the best experience for our clients.